No one plays poker in the 1983 film "WarGames," but the game is important to the story nonetheless. "WarGames" looks back on game theory & forward to AI while acknowledging poker's relevance to both. I'm happy to report that work on my book Poker & Pop Culture: Telling the Story of America's Favorite Card Game is now complete. It soon will be available in either paperback or as an e-book, published in time for the 2019 World Series of Poker. Poker & Pop Culture covers both the history of poker since its introduction in the early 19th century as well as the story of how the game has been portrayed in various cultural works such as in literature, paintings, film, television, music, magazines, and elsewhere. Along the way there also comes discussion of poker's many connections to other areas of American culture, such as business, politics, the military and warfare, sports, and more. During these next few months leading up to the book's publication, I'd like to share some anecdotes and material that didn't quite make it into Poker & Pop Culture — some "outtakes," as it were. I may continue afterwards with other discussions of material I wasn't able to cover (but would have liked to). I'll start with one story of poker popping in the cultural mainstream, albeit in an understated way. It's a movie in which poker has special significance, even if no one is actually shown in the film playing the game at all. The film is the 1983 Cold War drama WarGames starring Matthew Broderick and Ally Sheedy. If you've seen it, you might not remember how poker figures into the plot, but it does — and in an important way. The story involves a high school student named David (played by Broderick) unwittingly using his home computer to hack into the nation's nuclear missile launch control system, contained on a supercomputer called WOPR (War Operation Plan Response). Even worse, thinking that he's actually hacked into a computer game company, David chooses to play a game called Global Thermonuclear War, deciding to take the side of the Soviet Union versus the computer that takes the side of the United States. The game starts a simulation of nuclear war that unfortunately resembles a real one well enough to put both the U.S.S.R. and U.S. on high alert, increasing the chances of an actual nuclear war being mistakenly instigated by the superpowers misapprehending the other side's maneuvering (both real and simulated). What does poker have to do with such a story? As you might guess, the connection has to do with games — both war games and other kinds, including poker. In order to try to hack into the game company's computers and play their games, David has his computer dial all the phone numbers with prefixes matching those in the physical location of the company. That's how David unintentionally accesses the NORAD's computer — the WOPR — although when it presents him the option to play various games, it's understandable David thinks he has found the computer game company. There's another game on the list is called Falken's Maze, which a little earlier led David to discover correctly the name of the games' creator, Dr. Stephen Falken. That in turn helps David correctly guess a password (Falken's son's name, Joshua) that enables him to begin the game. What David doesn't realize is that in fact the game is a program simulating a nuclear conflict, the starting of which sends everyone at NORAD into a sudden, confused frenzy. Regarding Falken, David at one point explains how "he was into games, as well as computers. He designed them so that they could play checkers or poker [or] chess." "What's so great about that? Everybody's doing that now," says his friend Jennifer (played by Sheedy). Indeed, by the early 1980s there were lots of examples of such programs having been developed. If you were around and had a home computer back then, you probably played some of those games. "Oh, no, no, no... what he did was great!" answers David. "He designed this computer so that it could learn from its mistakes. So they'd be better the next time they played. The system actually learned how to learn. It could teach itself!" When researching Falken, David visits the library and finds a Scientific American article about Falken from June 1963, titled "Falken's Maze: Teaching a Machine to Think." He's shown locating another article co-written by Falken appearing in an old issue of The Atlantic titled "Poker and Armageddon: The Role of Bluffing in a Nuclear Standoff." Such details show how the character of Falken was clearly inspired by other real-life early computer programmers and developers of what would eventually come to be called "artificial intelligence," many of whom used strategy-based games like poker as part of their research. Of course, there are many connections between that research and "war games" including those concerning nuclear conflict. I've written here before (and do so in the book) about how John von Neumann and Oskar Morgenstern, authors of the groundbreaking 1944 work Theory of Games and Economic Behavior, used heads-up stud poker as a model game with which to explore theories of bluffing — part of the pair's larger study that helped introduce the hugely influential discipline of game theory. Those articles about poker and bluffing by Falken are clearly meant to allude to von Neumann and Morgenstern, as well as to game theory, generally speaking. They also recall the work of others like Nicholas V. Findler who worked on poker-playing computer programs in the early 1960s and similarly published articles sharing his findings. 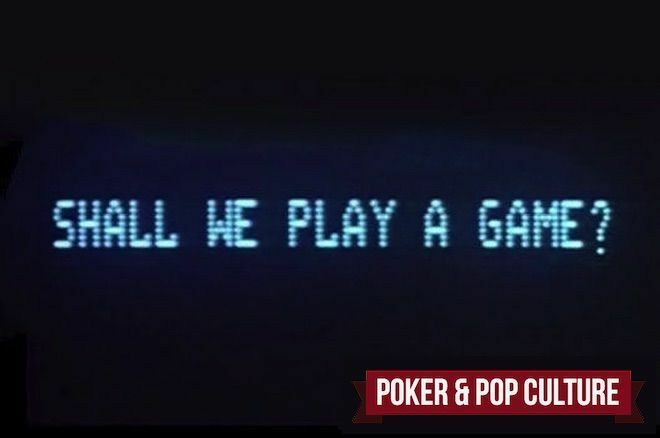 In other words, the game of Global Thermonuclear War the computer plays in WarGames was developed after its creator had similarly researched and developed earlier games for the computer to play and learn from, including poker. Historically speaking, the same was true for humans' study of strategic approaches to nuclear conflict, also greatly influenced by game theory and earlier examinations of bluffing in poker. If you haven't seen WarGames, I recommend it. It's entertaining and suspenseful, and while the overall plot may seem a little implausible it's nonetheless engaging throughout. Even the old technology — dial-up modems, text mode displays, and those massive floppy disks — isn't that distracting and kind of fun in a nostalgic way (for those of us who remember it). And the general message about the futility of trying to imagine a winnable nuclear war — something both humans and computers struggle to learn — still resonates. WarGames also subtly acknowledges the significant influence of poker strategy during the Cold War, a topic discussed in more detail in Poker & Pop Culture. Poker & Pop Culture: Telling the Story of America's Favorite Card Game will be published in both paperback and e-book versions in June 2019. Read more about the book — which is available for preorder — at D&B Poker. Photo: "The Edge of Gamification” (adapted), Steve Jurvetson, CC BY 2.0.